"I use these Solo Glue Riters all the time. Good product." 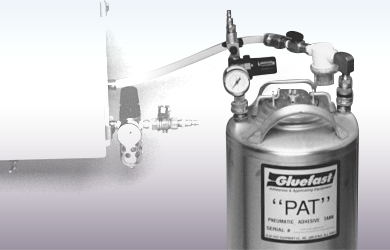 When you need a reliable glue bottle with precision control, trust the SOLO GLUE RITER® from The Gluefast Company, Inc. It is a small glue bottle with a ball-and-spring valve that applies a controlled amount of adhesive developed for the picture framing industry for gluing matboards and dustcovers onto the back of a framed print. 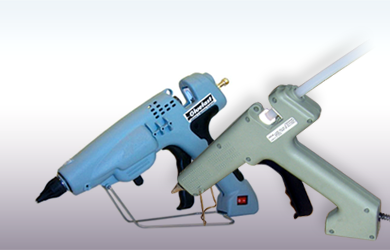 It can also be used to apply water-based adhesive for case and carton sealing, palletizing, and product assembly. With virtually no cleanup necessary, the SOLO GLUE RITER® adhesive applicator can be used to replace double sided tape for many applications at a fraction of the cost. What is the SOLO GLUE RITER® Adhesive Applicator? The SOLO GLUE RITER® is a simple plastic squeeze bottle that is filled with a fast setting, acid-free water based adhesive referred to as MATHESIVE. 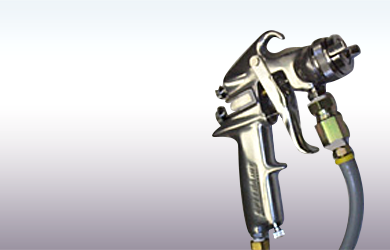 This adhesive glue applicator comes equipped with a uniquely designed nozzle that contains a ball-and-spring valve. 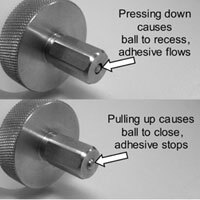 When the ball is pressed downward it recesses to allow adhesive flow. When the pressure on the ball is released the spring re-seats the ball to stop adhesive flow. Depending on the type of gluing job, the SOLO GLUE RITER® is available with MATHESIVE 101 or MATHESIVE 202 formulas. MATHESIVE 101 is an acid-free water based adhesive that is great for gluing matboard to matboard, paper dust covers onto wood, wood-to-wood and most paper to paper gluing jobs. Its viscosity was created specifically for use with the SOLO GLUE RITER®. MATHESIVE 202 is an acid- free water based adhesive that can do all of the gluing jobs that the MATHESIVE 101 formula can do, plus it is good for gluing paper dust covers onto styrene (ABS) frames also! How Does the SOLO GLUE RITER® Adhesive Applicator Work? To apply adhesive using the SOLO GLUE RITER®, simply remove the bottle from the stand, position the nozzle where necessary, and press down for a dot of glue or press down and drag the bottle along the surface for a line of glue. Pulling the bottle up from the surface causes the ball in the nozzle to close, which stops the flow of adhesive. When not using the SOLO GLUE RITER® it is placed in a stand, nozzle side down. Inside the stand is a moist sponge which prevents drying and clogging of the nozzle. It’s ready to work when you are! Applies a dot or line of adhesive approximately 1/2" wide. A 1/8" wide nozzle is also available. Bottle is refillable with MATHESIVE. Comes with a stand to prevent the adhesive from drying in the nozzle. 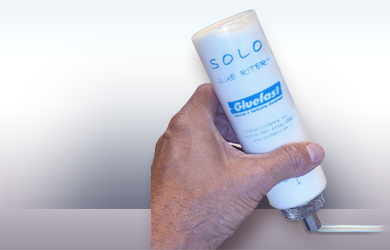 To find a local distributor of the SOLO GLUE RITER® adhesive applicator see below or order online now directly from Gluefast by clicking here. "We love the Glue Riter, there's no going back to a basic glue bottle..."